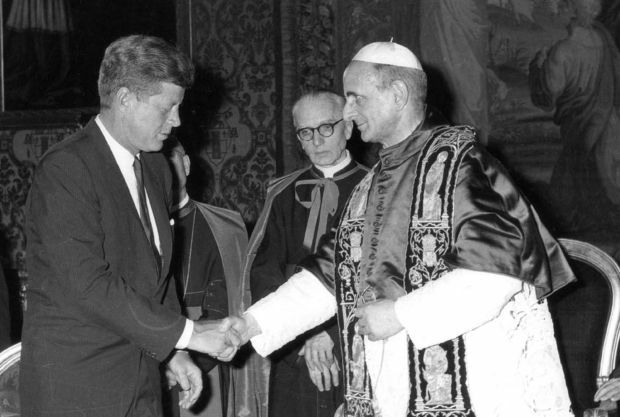 VATICAN CITY (CNS) — Pope Paul VI, who led the church between the pontificates of Blesseds John XXIII and John Paul II, may be beatified in October, an Italian Catholic magazine reported. Credere, a magazine run by the Pauline Fathers, reported April 24 that the alleged miracle needed for Pope Paul’s beatification would be considered by the cardinal members of the Congregation for Saints’ Causes May 5. The cardinals’ recommendation would be given to Pope Francis, who could order the publication of a decree recognizing the healing as a miracle. The Italian magazine said the beatification Mass likely would be celebrated in October, probably Oct. 19, the final day of the extraordinary Synod of Bishops on the family. The miracle being considered involves the birth of a baby in California in the 1990s, although to protect the family’s privacy, the child’s name and city have not been released. Credere said the mother’s pregnancy was at risk, and with it the life and health of the baby. Doctors advised her to terminate the pregnancy, but instead she sought prayers from an Italian nun who was a family friend. Praying, the nun placed on the woman’s belly a holy card with Pope Paul’s photograph and a piece of his vestment. The baby was born healthy. For Pope Paul’s sainthood cause, physicians continued monitoring the child’s health up to the age of 12 and everything was normal, Credere reported. Born Giovanni Battista Montini in 1897 in the northern Italian province of Brescia, Pope Paul is probably best remembered for seeing the Second Vatican Council through to its end and helping implement its far-reaching reforms. He was elected in 1963 after the death of Blessed John and died Aug. 6, 1978.